German Chancellor Angela Merkel and French President Francois Hollande did not consult Washington before deciding to visit Moscow to hold talks on the Ukrainian crisis, a source in the French government told AP. The two leaders, who are part of the so-called ‘Normandy Four’ group along with Moscow and Kiev, decided on a trip on Wednesday night, an unnamed French government official said. 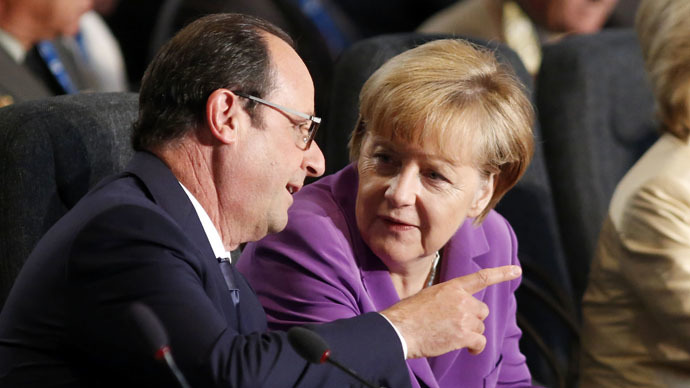 Merkel and Hollande are due to arrive to the Russian capital on Friday, the next day after visiting Kiev. After the Thursday meeting with the German and French leaders, Ukrainian President Poroshenko said that the talks indicated that a ceasefire was possible in eastern Ukraine. Meanwhile, a senior French officialtoldlocal weekly Le Nouvel Observateur on Thursday that the decision to meet tet-a-tet with President Vladimir Putin was taken on Tuesday after the Russian leader called on both sides in the Ukrainian conflict to stop military actions and hostilities. The French weekly also said that this “historic initiative” on the part of the two European leaders was preceded by “secret” talks between Paris, Berlin and Moscow. As Hollande and Merkel are set to discuss a peaceful resolution to the conflict, the US Secretary of State John Kerry is in Ukraine to answer Kiev’s plea for weapons. Kerry told reporters that US President Barack Obama will make his decision on the possibility of sending lethal aid to Ukraine next week. The White House however admitted on Thursday that military assistance from the US could increase bloodshed in the region. The journalist elaborates that the two leaders went to Kiev straight after Kerry as they “distrust the American administration” and want to “present their diplomatic solutions just before US Vice President Joe Biden” presents the US plan of sending lethal weapons to Kiev at the Munich security conference on Saturday.